One of the important considerations in many financial transactions is the tax treatment the transaction is given. Often, the impact of taxation is a consideration in the purchase of life insurance every bit as much as it applies to stock purchases, bond purchases and the establishment of qualified retirement plans. Use in a qualified retirement plan. 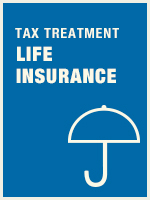 Describe the income tax treatment of accelerated death benefits, viatical settlements and life settlements.